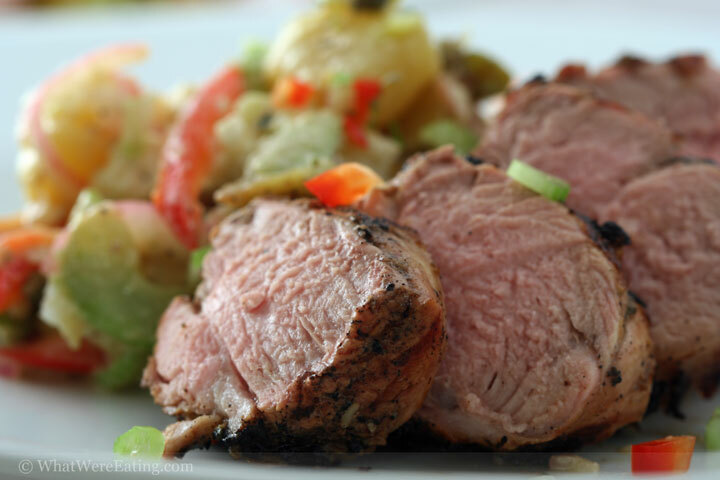 Sometimes you just get a craving for some meat and potatoes… unless you’re a vegetarian. That’s the craving that hit us for this dinner. We’re eating marinated grilled pork tenderloin served with roasted sweet potato and green bean salad. The potato salad was dressed with a dijon-pomegranate molasses dressing for a unique and decidedly tasty flavor. T: I suspect even vegetarians get the occasional meat craving… eh? A: great question. vegetarians? are you out there? reading this meat-centric blog? do you get the occasional craving for meat? A: ha! what that proves is that michelle was not a vegetarian at all! oh silly michelle. T: Anyway, this potato salad was awesome. The pork was good too, but the potato salad was freaking fantastic. I’ve had tons of potato salad in my day, but most of them were prepared similarly. This one was different, and it was really good. Cheers to ya! A: thanks t! i really dug the potato salad too. the combination of mustard and pomegranate molasses really works well together. if you’ve never tried it you really should. but go somewhat sparingly on the pom. molasses – it can certainly over power. the pork was actually marinated in the base vinaigrette that became the dressing for the potato salad. i thought eating a bite of pork and salad at the same time really made for some great flavorage. T: I love how you use the same or similar sauces in different parts of the meals you cook… really ties everything together. Alright, I rate the potato salad a 4.8/5. That stuff was solid. The pork went really well with it, although it was far less exciting for me. Overall I give the meal a 4.7/5. Clearly the potato salad was good enough to keep the overall score pretty high. Anybody who’s bored with potato salad should really try this stuff. A: for sure. i don’t think we’ve even mentioned outside of the intro that we used sweet potatoes. i think they really worked well with the flavors in the dressing. so…. i think i’m going to give the meal an overall score of 4.44/5. it really did excite my taste buds. i guess i’m still kind of bored with everything i’ve been making lately. in the past this meal might have gotten a higher score from me, but hey! there’s always the future. T: I know what you can do to break out of your boredom…. do you? T: ding ding ding! Make sausage!! Sounds pretty exciting huh? I’m excited. A: oh i know you are! you’re always game for a good wiener. i cant wit for this recipe because it never occurred to me to roast green beans, but i want to eat some bad! you really have the magic touch with the puerko! Oooh, the combination of the tangy dressing and the sweet potatoes sounds so fantastic. I could never be a vegetarian, not even for a week. I am not willing to let my principles affect my diet, heathen that I am. Please please please please please please please make sausage next! Maybe a bit of andouille for your Louisiana heritage? And then you could stuff it into some chicken wings and smoke it…and maybe wrap it in bacon…now I’m just torturing myself. I agree… PULEEZE make sausage Amanda! Maybe y’all should keep sausage makin’ a private affair…. Okay, so I ate some fried chicken! I’m still a vegetarian (mostly). I miss certain kinds of meat sometimes. The non-meat portion of this salad looks so tasty! Post that recipe, lady! I don’t crave meat. Then again, I was raised vegetarian so I never really got the opportunity to love meat. I ‘spose it depends on how long you’ve been meat-free. On another note, this looks delish! Am I cyber-dense or what? I can not get your Web site to give me the e-mail address for Roasted Green Bean and Sweet Potato Salad from Jan 8, 2008. Is there some kind of trick to getting the actual recipes? How do you ready the recipes?? 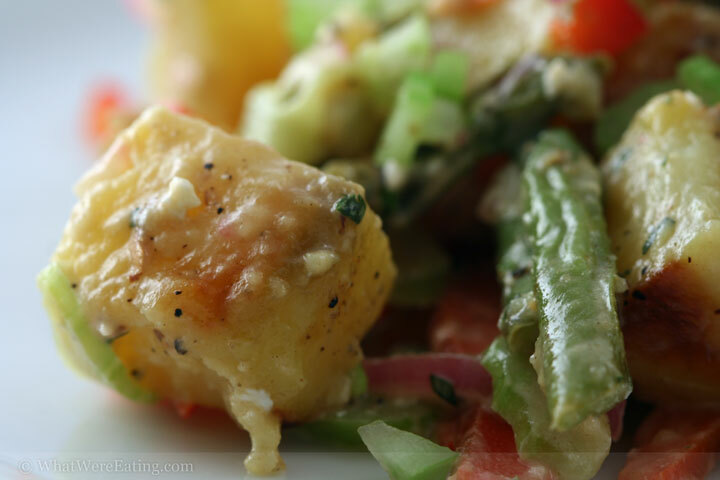 Just about went crazy looking for the recipe for roasted green bean-sweet potato salad! Decided that you were only teasing us, as it doesn’t seem to exist in cyberspace or on your website. (Or maybe it’s not Mac-friendly.) If it does actually exist, would it be possible to post it, or even email it to me? Oh, yeh–we’re having your herb-roasted turkey breast today (Thanksgiving Day)! Sounds incredible. Please send me the recipe for the roasted greenbean/sweet pot. salad. If i make it, they will come. Agreed – way better than average potato salad. Made up a batch last night – delish. Could I get this recipe? This sounds delicious and I love to change up how I make sweet potatoes every year! Heidi – Unfortunately I made this years ago and didn’t write a recipe for it when I was making it. I wouldn’t feel comfortable just winging a recipe years later because I don’t want it to be a failure! I’m sorry!